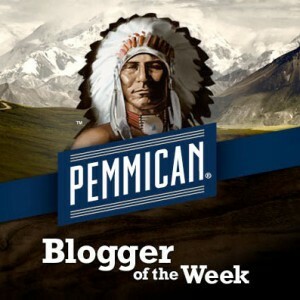 And now I can finally reveal the shocking truth behind the Tell Your Most Extreme Hiking Tale giveaway: it all started because somebody on the social media team for Pemmican Beef Jerky picked an opportune time to flatter my ego by interviewing me for their Blogger of the Week feature on their Facebook page (pretty much any time is opportune for this, actually). That happened way back in the middle of September. Questions were sent, answers were sent in reply, and an offer beef of jerky was presented as a thank-you. Normally I’m ethically opposed to accepting freebies, but I figure most of the terrible things in history have been the result of fanatical devotion to a belief, so now and again I relent. They mailed me the nifty gift box, but when it got here I realized something: I’ve never been a fan of beef jerky. A few weeks back the folks at Pemmican finally told me when my interview was actually going to be published, which, coincidentally, happened right when I was looking for an excuse to post something on the hiking blog that did not require actual hiking (I know, heresy). So I figured that the surest way to unload the box o’ jerky was to stage a giveaway, with the prize going to the contributor of the most extreme hiking tale, as judged by Two-Heel Drive readers. Tuesday, Nov. 8, 2011, was the last day to vote in the contest, by the way. Here’s the winner. So next time somebody tells you nothing good has ever emerged from a marketing department or social media team, you can cite all the very cool entries hikers contributed in the contest, and, hopefully, all the people who were inspired to avoid trail-related extremities in the future.